...now will you release my friend? William (Billy) Cottrell had the foresight, enthusiasm, and energy to speak up about Global warming years ago when Hummers seemed poised to take over the world and before Electric Vehicles became cool. His big plan was to bumper-sticker cars with the message: SUVs promote Terrorism. My car at the time was my dream ride, a Jeep Cherokee. So I agree there are people more apt to challenge convention than I, yet we must all feel blessed that people like him see a new way and alert all the rest of us to it. Society would be horrid without the elements that move for change. It's in fact our responsibility to change the world for the better, even if the hordes are wrong wrong wrong. I also appreciate the stability-drivers of society. They may be bored to tears, not to mention boring, but this yin and yang world needs all kinds of people. I wouldn't have minded the bumper sticker or the message. I thought Billy suffered mostly from poor timing in being picked up for a crime labelled terrorist so soon after the shock-and-awe invasion of Iraq: FBI careers depended on nailing him. President Bush's Americanism required everyone to close ranks against these anti-war and anti-oil folks. There was even insurance cash to be reaped by a few lucky mercenaries after the arson attacks. Yin and yang baby. Fun stuff. 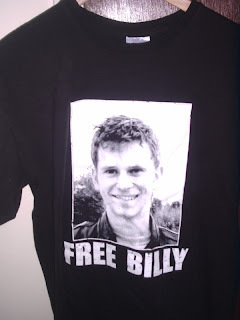 Now that the climate has changed :) maybe it's time to free Billy. For reals. It may even be time to free thousands from the cruel pressures of gaol. 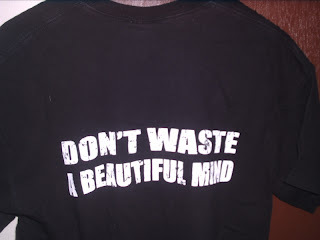 Please don't waste their time. My TV Channel nowadays is The Tennis Channel. I can't stop watching. What's on now? The Madrid Masters tournament. What's new in tennis video on youtube? It's Part 2 of a Rome-themed work featuring Roger Federer, Ana Ivanovic, and Rafael Nadal. You may also watch Part 1, catch Pussycat if you missed it, and see more cool Roger y Rafa videos.